Our company has a 15,000 sq ft facility. Our fully extracted Shot Blasting bay is 12m x 4m x 4m. Smaller items can be accommodated in our hand cabinets. 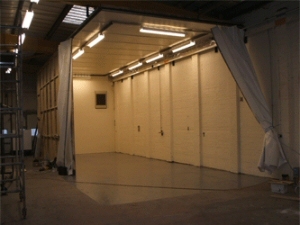 Our Bead Blasting and Aluminium Oxide Blasting room can accommodate items up to 6m x 3m x 3m. Larger projects up to the size of our Shot Blasting bay can also be handled by arrangement. Our paint booths occupy an area of 3,000 sq ft (fully extracted). Our Powder Coating ovens are 9.6m x 3m x 3m and 4m x 3m x 3m, giving us the flexibility to handle large and smaller components of varying quantities. We also offer Burn Off Services. Our larger burn off oven is 4m x 3m x 3m. Smaller items can be accommodated in our 2m x 2m x 2m oven. And our two heated paint ovens, each 12m x 5m x 2½m, can be used to cure paint finishes at up to 60°C, offering a faster turnaround.